This is the story behind my Guinness World Record™ for the Fastest time to break 10 plastic coat hangers. I couldn't stop staring at women's upper chests in the street. No! I wasn't amusing myself. But I was calculating how I could succeed. My world record obsession was surfacing once again, it seemed. I was determined to find out the size of the smallest adult bra. Before I did the obvious thing – walk into a shop and ask, I thought I'd try to see for myself. Yet, no matter how much I looked, I couldn't figure it out. I decided the more traditional method of getting the answer was what I needed to do. In the women's underwear store, I knew I looked completely out of place. Not only that, but I had walked in alone. Although she didn't show it, the counter attendant was alerted by my purposeful striding, I was sure. She leaned forward to ask if she could help, but probably also to stop me getting to the back of the display floor. I stared at her for a second. She returned the stare, and began to frown. I muttered, cleared my throat and repeated myself – loudly. “No need to speak at such volume, sir” came the reply. I felt embarrassed. But at least we had exchanged words. Only when I mentioned the phrase 'world record attempt' did the assistant relax. Puzzled, she waited for the details. Hearing them, much to my surprise, the woman asked me to wait, with a hint of a smile. Out came a large bag. Together we sorted various sizes of coat hangers, and I learned that bras came in very small sizes on coat hangers to match. I snapped one. Shards went flying over the till, across the counter and a piece landed in my hair. This make of coat hanger would be perfect. It would possibly also be the first and last time I'd have such close contact with a large volume of bra coat hangers! We filled several bags, shared a brief giggle, and I left the women's underwear shop amid other female customers. The only difference in our baggage, it seemed, was that mine contained no underwear. I was pleased. Into the car I loaded nearly 4kg of coat hangers and drove home at top legal speed. If a traffic officer had stopped me, I figured, I'd try to dismiss them by saying I was in a hurry to smash coat hangers for the world's entertainment. Then, hearing myself thinking those words, I promptly decided to avoid disaster and I slowed down. In one spacious room, I held each coat hanger to the light. The ones I'd choose would have to satisfy specific rules, and I wanted to separate the very best of the lot from the others. To ensure I did the job correctly, I allocated this task 2 hours of my afternoon. To me, that was time well spent. Unfortunately, the others there didn't appreciate my lack of social graces in favour of a heap of plastic. I explained, but got no sympathy. I waved everyone out of my presence and made it clear what was infinitely more important, much to their disbelief. This was to be a joyous time, I reassured myself, and threw all my concentration at the task. Rubbing my hands with delight, I planned things. Out of the best coat hangers I'd picked, I'd leave one heap in the room and take two smaller piles outside where my test site would be. Handling them with great care, I stepped out to the back yard and laid out my own private stage. My blood pressure was rising, I was that excited. On bent knees, and with my stopwatch laying alongside, I figured that I could snap a row of hangers and, with lightning speed, turn my gaze to focus on the racing stopwatch to gauge my speediness. Of course that wouldn't give perfect readings, but it was better than guessing my ability. In my mind's eye, I envisioned myself as an artist in a music concert about to begin, with crowds jostling right in front of my 'stage', going wild. I puffed up my chest and smiled out to the plants around the garden; the mythical audience I'd created for the afternoon. Again in my mind, I heard the countdown instruction to begin. The make-believe mass of fans roared and shrieked their encouragement. With unimaginable speed, my forearms extended and gripped the first coat hanger. Almost instantly, it snapped and slivers of plastic exploded through the air like sun rays. Even before every piece had landed, I was onto the next, and the next. Like a machine designed for destruction, my hands destroyed hanger after hanger. In my head, the very loud audience was on the verge of pandemonium from sharing my exhilaration. Waves of pleasure flashed through my chest, filling me with vitalising energy. I was in utopia – smashing women's coat hangers for the shrubs and flowers in my garden to witness. This was simply bliss. Seconds later, it had all come to an end. It was silent. In the distance I could hear the chirping of a lone garden bird. The shrubs and flowerbeds looked just the way they had when I'd begun. There was nothing different except for broken coat hangers lying around me. I was no longer in my mental dreamland; a famed musician on stage. This was anything but! With pursed lips, I picked up the mess and accepted that all I was, was a coat hanger smasher of no consequence. Before slipping into depression over this disappointment, I promised myself that I'd practise until I was the best I can be. So, gradually, the garden became a dump: bits of coat hangers across much of it. It was all but impossible to forget about the pieces – it only took one shard of rigid plastic stabbing me in the foot to keep me aware. Soon, the piles of suitable hangers had dwindled. I set aside the remainder for the real event, now confident that I was the king of coat hanger breaking. Feeling sure of myself, I waited patiently for my turn to prove myself. The world record-breaking event I'd been invited to participate in arrived. I was quite relaxed about this particular attempt. At the venue, others were rushing to and fro, busying themselves with the things they'd come to do. I sauntered over to the administration table where the many participants in the day's activities had registered. With my assistants' help, I cleared a small area and laid out the precious feather-light coat hangers. 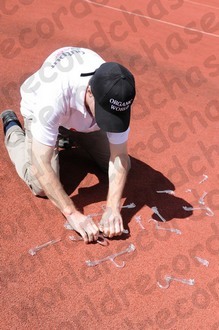 With great care and precision, I placed each exactly where I wanted it – lying a set number of millimetres from the next. My helpers waited and waited while I made sure every coat hanger was correctly angled. When I'd satisfied myself, I stood back. With a twinge of guilt striking at my heart, I organised my team. I felt like a firing squadron chief, about to end the lives of specially chosen victims in an instant. That worried me, but then I cast my thoughts elsewhere, reminding myself these were items of plastic, of no real value. With that thought to spur me on, and my adrenalin pumping, I checked that everyone was ready and I gave it my all. Click, snap, ting, crack and smash. In almost as many seconds, as recorded by the timekeeper, no coat hangers remained. My energy was at a peak. I stood bouncing on my feet from pent up enthusiasm. It was crazy. This was the sort of excitement that a starving animal would display once given a taste of its favourite food but no more. And that was the case – there were no more; no more whole coat hangers. I had no option but to subdue that rise in anticipation and think with clarity. It was quite an anti-climax. The only thing left to do was to finish off the admin, which I did reluctantly. Spectators watched, but unlike at my antics in public, these people seemed highly supportive of what I was engaged with: trying whatever I could do gain more world records. Perhaps that respect came because we were at a specifically designed world record-breaking event, so most people there would have been commending others' achievements throughout the day. I was still pleased, to say the least.